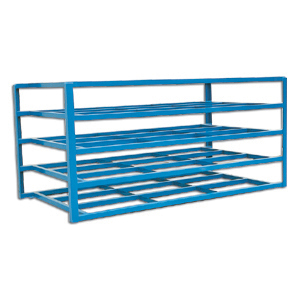 Sheet Rack For Warehousing, Industrial | Ace Industrial Equipment, Inc.
Sheet rack is a great choice to store long, wide and thin materials without damaging them. Sheet rack helps prevent warping of thinner material and is a very safe way to store such items. The sheet rack shown is made with 5 bays to all for generous storage space of different materials of varying thickness. The welded steel frame allows for 2000lb. Capacity per shelf. The sheet rack has 4 sided access when using the 4’ x 8’ sheet or smaller. On occassion, Ace gets in used sheet rack at big savings so be sure to ask. 1-800-300-6034. We proudly serve businesses throughout the nation, including those in Atlanta, Charlotte, Tampa, Dallas, Roswell, Chicago, Louisville, Oklahoma City, and Washington, DC.